The C&C Burkman Family Blog:: Yum Yum! Carter LOVES food. More specifically, he loves Mexican food. Rice and beans, quesadillas, tortilla chips, and anything any everything similar. 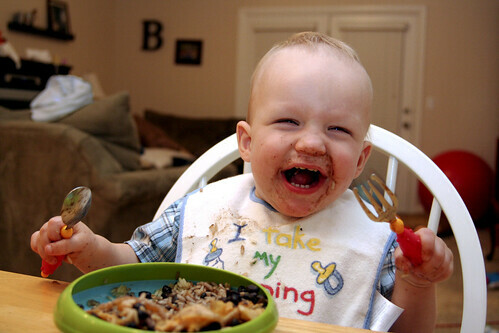 Combine that with being able to use his own fork and spoon in his very own bowl and you’ve got the perfect formula for a very happy boy, as the picture below slightly demonstrates. Ha ha I love this picture! But it makes him look like a kid, not a baby.. :( Carter's not allowed to grow up!! What a cool little guy! Your design looks great. I agree with you about all the scrapbook looking templates out there. Good job! Too cute! I love those messy food pic's! That is so cute, I love the look on his face like nothing in the world could be better then eating Mexican Food with his own fork. Cute kid.